Clinic Synopsis: The objective of this clinic is to provide specific techniques for teaching jazz improvisation during full jazz band rehearsal or in non-jazz combo settings. Many schools fail to teach improvisation because they say, “we don’t have a combo program at our school.” Attendees will learn how to offer jazz improvisation as a normal part of every rehearsal. Players can learn to improvise in a nurturing and supportive environment. Clinician Biographical Information Ronald Carter is professor of music, coordinator of jazz studies, and director of the jazz ensemble at Northern Illinois University. He was also director of the renowned jazz ensemble at Lincoln High School in East St. Louis, IL for eighteen years. As a graduate of Bethune Cookman College and the University of Illinois, he is active as a clinician, guest conductor, and performer throughout the United States and abroad. 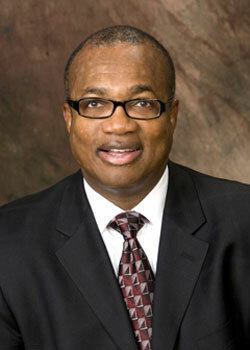 In 1991, he received the Milken Educator Award and later the NIU Board of Trustees Professor Award. He is a published author with GIA Publications, Inc., and Alfred Music Publishing. Carter is a consultant for Essentially Ellington and a lead artist for the Band Director Academy at Jazz at Lincoln Center. He is currently a featured artist for Conn-Selmer Inc., Rico Reeds, and D’Addario & Company.